It seems the 80's throwback wave is in full swing these days, with a large number of under-the-radar films coming at us at breakneck pace. So fast in fact that it's hard for me to keep track of what's coming out, what's trying to get funded through a crowd-funding campaign, and what's hitting the festival circuit. This one just seemed to come out of nowhere for me. I knew nothing about it and I had never even heard of it until it first hit On Demand a short while ago. Unlike The Void, which had been generating a lot of buzz right from the beginning with it's crowd-funding campaign, this one really flew under the radar....for me anyway. So ever since it hit On Demand, I'd been eyeing to rent it through Amazon, but never got around to it. Fast forward a few months and Netflix is now offering it. Yes! So here we go. 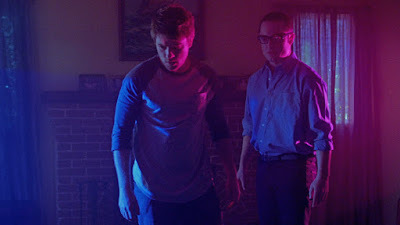 2 adult brothers, who obviously don't spend a lot of time together, are forced to reconnect after the disappearance of their father. As they begin clearing out their father's Video Store, they find an old VCR game that was locked away in a safe. Curious, they begin to play it, only to discover that this very game may be the reason for his disappearance. 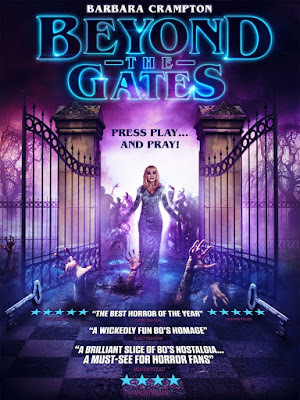 Beyond the Gates was a refreshing bit of horror for a number of reasons. While it's not mind-blowing, it's well done and entertaining enough to come off as being better than a lot of other recent 80's horror throwback films in the last few years. In short, it was really good and a lot of fun, but it wasn't great. This one is unique though. It clocks in at just under an hour and a half, making it a breeze to sit through, and unlike a lot of the other films that claim to be a throwback, this one actually looked and felt like one. The camerawork, lighting and synth score all lend themselves to an authentic experience, the kind that The Void was unable to pull off effectively. Writer/Director Jackson Stewart does a competent job behind the camera, not over stylizing the film, which is exactly what it needed to produce that specific throwback feeling. Unlike films like The Void, The Minds Eye and Almost Human for example, where the director or directors forget what an 80's horror film used to look like, instead deciding to shoot them using handheld, giving it the annoying shaky-cam look, which ultimately just comes off as lazy. The whole angle about summoning the world beyond through the use of a vintage VCR game makes this one a standout among the crowd. The nostalgia factor is big here, and it's because of that I personally really enjoyed it. I know nostalgia isn't everyone's cup of tea, and that it doesn't guarantee a success, but I found it actually worked well in this one. I used to play these terrible VCR games, and still have my Robocop version, which I purchased at Service Merchandise (remember them!?) 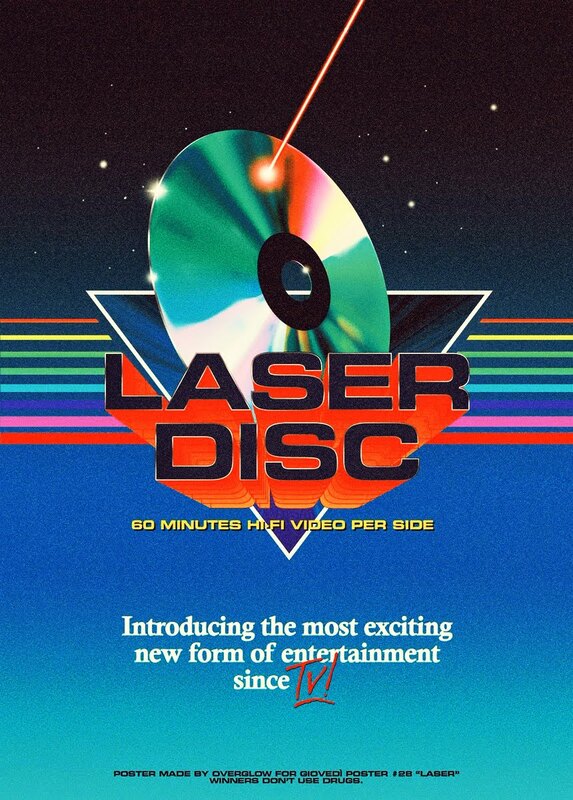 after the release of the first film in 1987. It's a terribly boring game but a cool thing to look at sitting on my shelf. But this was a clever and unique way to tackle the throwback genre, which is already beginning to feel stale and overly saturated. And let's be honest, most of these end up being "misfires". So it was nice to actually have one that we legitimately enjoyed for the most part. Barbara Crampton, the big name headlining this project, does a fantastic job in the role of the VCR Game host. Sure you only ever see her on a black and white TV screen, but even in this limited capacity, boy does she leave an impression. Honestly, I couldn't think of anyone else who could have effectively pull this off, other than Elvira herself, Cassandra Peterson. The rest of the cast do a fine job in their respective roles, especially the main guy, Graham Skipper, who also just happened to star in The Minds Eye and Almost Human, 2 other throwbacks from writer/director Joe Begos that did some things well but ultimately didn't provide the full experience you were hoping for. So Beyond the Gates, while not perfect, was to me, a better more fulfilling experience. If I had anything to complain about, it would be 2 things. The first being that they really missed out on a great opportunity to cast a cult icon in the role of the missing father. My mind immediately went to someone like Bill Moseley. But hell, someone as recognizable as Bruce Davison would also work. Sure it's a small role, but it could have really been a memorable one with the right casting. And then there's the slightly abrupt ending that tied everything up nice and neat. I didn't seem to think it was as "abrupt" as others, but I found it oddly quick, without much of a payoff. It's a cool ending mind you, but with the buildup, you kind of expect more. All in all, a highly satisfying little film that did what most others try to do and fail. The acting is on point, and the use of certain colors, a retro synth score (important! ), and a very pleasing visual aesthetic all make for a film experience that's surprisingly enjoyable. The best option right now it that it's streaming on Netflix. For how long is anyone's guess, but since it just became available it should be there for a good amount of time. You can currently pick up the DVD and Blu for fairly cheap, running you from $10-$20.